Welcome To The Hostel Microsoft. Such A Lovely Place. It was almost exactly a year ago that we wrote about the Googlle Institute of Software Studies, a cleverly-named online university based out of India. After our post on the institution offering students such degrees as a “GCPA” — Googlle Certified Professional in Advanced Computing — it didn’t take long for the website of the school to be shut down. But the person who originally tipped us off to those shenanigans is now back with another fun one. And apparently, it’s based out of the same city in India. Say hello to the “Hostel Microsoft”. 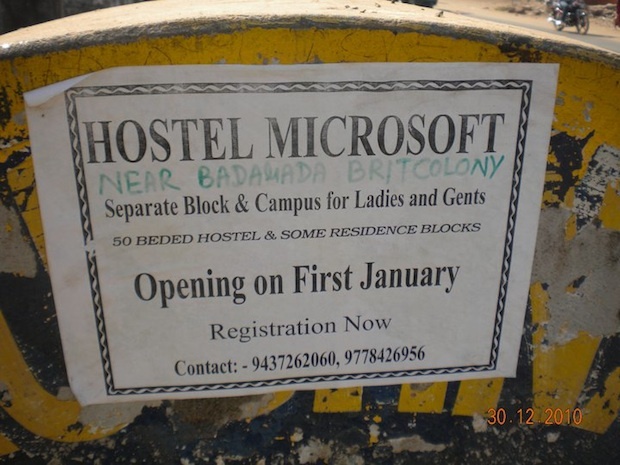 Near a place known as “Badarad Britcolony”, Hostel Microsoft apparently offers separate blocks and campuses for ladies and gents. It’s apparently a hostel with some 50 beds in it. It also has some residence blocks, whatever that means. And it’s opening in the beginning of January. That sign coming down in 5, 4, 3,….